Despite their unexpected naval success, the Confederate generals were still gloomy about their chances in the fort and held another late-night council of war, deciding to retry their aborted escape plan. 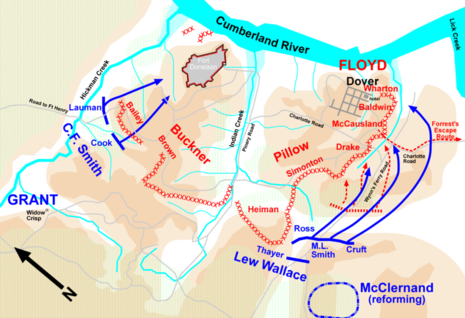 On the morning of February 15, the Confederates launched a dawn assault by Pillow against McClernand's division on the still unprotected right flank of the Union line. The Union troops were not caught entirely by surprise because they had been unable to sleep in the cold weather. But one Union officer was surprised—Ulysses S. Grant. Not expecting any land actions that he did not initiate himself, Grant was up before dawn and traveled to visit Flag Officer Foote down river on his flagship. He left orders that none of his generals was to initiate an engagement, and he left no one designated as second-in-command during his absence. The Confederate plan was for Pillow to push McClernand out of the way and for Buckner to move his division across Wynn's Ferry Road and act as rear guard for the remainder of the army as it withdrew from Donelson and moved east. A lone regiment from Buckner's division—the 30th Tennessee—was designated to stay in the trenches and prevent Federal pursuit. The attack started well, and after two hours of heavy fighting, Pillow's men were able to push McClernand out of the way and open the escape route. It was in this attack that Union troops in the West first heard the famous, unnerving rebel yell. 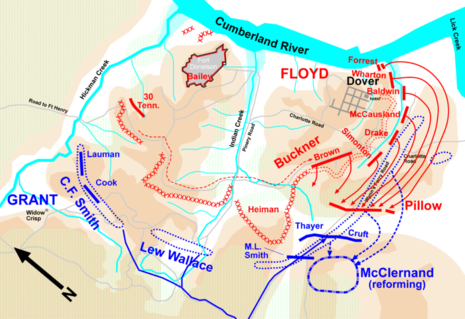 The attack was primarily successful because of the poor positioning of McClernand's troops, and a flanking attack by sometimes-dismounted Confederate cavalry under Forrest. The brigades of Cols. Richard Oglesby and John McArthur were hit hardest; they withdrew in a generally orderly manner to the rear for regrouping and resupply. McClernand sent messengers to obtain assistance from Lew Wallace, but Wallace was reluctant to act without orders from Grant, who was still absent. McClernand's withdrawal had not yet assumed the frantic energy of a rout, but ammunition was running out. (The army of former quartermaster Ulysses S. Grant had not yet learned to organize supply lines effectively, and extra ammunition was not immediately available to these front-line brigades.) A second messenger arrived at Wallace's headquarters in tears, crying "Our right flank is turned! ... The whole army is in danger!" Wallace finally released one of his brigades, under Col. Charles Cruft, to aid McClernand. Cruft's brigade replaced Oglesby's and McArthur's in the line, but as they realized they were being flanked, they too began to fall back. Not everything was going well with the Confederate advance. By 9:30 a.m., as the lead Union brigades were falling back, Nathan Bedford Forrest urged Bushrod Johnson to launch an all-out attack on these disorganized troops. Johnson was too cautious to approve of a general assault, but he did agree to keep the infantry moving slowly forward. Two hours into the battle, Gen. Pillow realized that Buckner's wing was not attacking alongside his. After a confrontation between the two generals, Buckner's troops moved out and, combined with the right flank of Pillow's wing, hit W.H.L. Wallace's brigade. But this delay of Buckner's provided time for Lew Wallace to reinforce McClernand before he was completely routed. The Confederate offensive stopped around 12:30 p.m., when Col. Thayer's Union troops formed a defensive line on a ridge astride Wynn's Ferry Road. The Confederates assaulted three times unsuccessfully and withdrew to a ridge one half mile (1 km) back. Nevertheless, they had had a good morning. They had pushed the Union defenders back one to two miles (2–3 km) and had opened their escape route. Grant, who apparently could not hear the sound of battle, eventually was notified by an aide. He galloped 7 miles (11 km) over icy roads to reach Wallace's headquarters by 1:00 p.m. and was dismayed to find the confusion and lack of leadership he had left behind. McClernand grumbled "This army wants a head." Grant replied, "It seems so. Gentlemen, the position on the right must be retaken." But true to his nature, Grant did not panic at the Confederate assault. As he rode back from the river, he heard the sounds of guns and sent word back to Foote to start a demonstration of naval gunfire, assuming that his troops would be demoralized and could use the encouragement. Grant observed that some of the Confederates (Buckner's) were fighting with knapsacks filled with three days of rations, which implied to him that they were attempting to escape, not pressing for a combat victory. He told an aide, "The one who attacks first now will be victorious. The enemy will have to be in a hurry if he gets ahead of me." Despite seeing that his attack was successful and his escape route was open, by 1:30 p.m. Pillow believed he should regroup and resupply his wing before pushing forward and, to the amazement of Floyd and Buckner, he ordered his men back to their trenches. At that moment, Floyd lost his nerve and, believing that C.F. Smith's division was being heavily reinforced, ordered the entire force back inside the lines of Fort Donelson. Grant moved quickly to exploit the opening that the indecisive Floyd had left him and told Smith that "All has failed on our right—you must take Fort Donelson." Smith replied, "I will do it." Smith formed his two remaining brigades to make an attack. Lauman's brigade would be the main attack, spearheaded by Col. James Tuttle's 2nd Iowa Infantry. Cook's brigade would be in support to the right and rear and act as a feint to draw fire away from Lauman's brigade. Smith's two-brigade counterattack quickly succeeded in seizing the outer line of entrenchments on the Confederate right, where the 30th Tennessee, commanded by Col. John W. Head, had been left behind from Buckner's division. Despite repeated counterattacks over two hours, the Confederates could not repel Smith from the captured earthworks. The Union was now poised to seize both Fort Donelson and its river batteries when light returned the next morning. On the Union right, Lew Wallace formed an attacking column with three brigades—one from his own division, one from McClernand's, and one from Smith's. Col. Morgan L. Smith's brigade from C.F. Smith's Division was composed of two regiments formerly commanded by Wallace and it was chosen to lead the attack. The brigades of Cruft (Wallace's Division) and Leonard F. Ross (McClernand's Division) were placed in support on the flanks. Waiting just a moment for Col. Smith to light a cigar, Wallace ordered the attack forward. Smith's brigade advanced a short distance up the hill, repeatedly rushing and then falling to the ground in the prone position, all the while listening to taunts from Drake's Confederate brigade opposing them. Wallace's troops charged and succeeded in retaking all the ground lost that morning. Smith was on horseback immediately behind his lead regiment and a bullet shot off the cigar close to his mouth, but he coolly replaced it with a fresh one. By nightfall, all of the Confederate troops had been driven back to their original positions. Grant began planning to resume his assault in the morning, although neglecting to close the escape route that Pillow had opened.